We view gum and teeth imbalances as an opportunity to improve the fundamental microbial ecology of the mouth. Bind up the bad bacteria and boost the body's ability to heal, and gum pain, gum bleeding or receding gums, will disappear. Simply read our testimonials - they say it all. Our remedies’ base is special magnetic healing earths found in high vortex energy areas. When combined with vibrationally imprinted essential oils and botanical extracts, the results are a powerful formula for optimal gum health. Due to hyper-oxygenated oils, some people have also experienced a high degree of teeth whitening. Promote Gum Health through natural, high-energy mineral earths and conscious intent. At Ascended Health, we believe that disease is a sign that your body is out of tune. Like a car with an unusual hum, its not useful to add more gadgets to the car in order to muffle the sound, with the hope that it will go away. Fixing the car involves finding its proper frequency for optimal functionality. Disease is our bodies’ way of telling us that we need to make our cells run at a different (and usually higher) frequency. So we wrestle with the following questions: How do we support our body so that it can resonate at its original and optimum frequency? Can we do this for the whole body, and if not, can we raise the vibration of a specific part? If so, what are the techniques that affect the whole body? What are the techniques that affect certain parts? We have found that raising your body to its optimum frequency consists of exogenous (i.e. outside) influences (what we eat, what environment we place ourselves in) and endogenous (i.e. inside) influences (what we think, what we feel, what we say internally to ourselves). "Particles respond to what we believe they are going to do"
We take this to mean that your mind, when fully intent and present, is an active participant in the healing process. What you think really does matter. In fact, matter itself is an expression of the energy that exudes from what you think. This is why we put so much conscious intention into our formulas. 4. Save hundreds of dollars on major dental procedures. The first step in our selection process is to identify natural, non-synthetic ingredients that carry the vibrational frequencies effective in counteracting gum pain, gum infection, and tooth pain. We then find ingredients with frequencies that regenerate gum tissue. Raw, organically grown and ethically harvested ingredients are always best. As many intuitively know, the highest vibrational frequency can be found in food that is live and unprocessed. The same is true with minerals—those with the highest frequencies must be harvested directly from the earth, unrefined, and naturally filled with the magnificent vibrational grounding energy that can only be found in Mother Earth. We find synthetic, man-made ingredients nonsensical. Using machines to break down and then re-create what God has already given us will always produce lower vibrational ingredients than those that are naturally harvested. Often these breaking down processes strip out any accompanying live enzymes and co-factor molecules needed to make the synthetic ingredient optimally active. For example, if the magnetic mineral earth we used were to be processed, irradiated, or otherwise impacted in any way, much of the energy and live enzymes present in the earth would be destroyed. Unlike other toothpastes, Oralive is a living nutritional supplement, one that you can actually eat and absorb through the mouth mucosa. It is comprised of over 27 essential oils, botanical extracts, gem essences, and flower essences. We researched many indigenous cultures to discover their natural methods of restoring gum and teeth health. Guess what? Before modern dentistry, people actually did manage to keep their teeth healthy using natural ingredients. We have the advantage of combining the best of these ingredients from all over the world. The oils that we use in our formula are quite complex, and designed to naturally manage the anaerobic bacteria, fungus, and viruses that may be causing the imbalance. We have found several oils and extracts that also relieve gum and tooth pain. The sugar we use to sweeten the paste is Birch Bark Xylitol, a compound known to inhibit the bacteria that cause cavities. 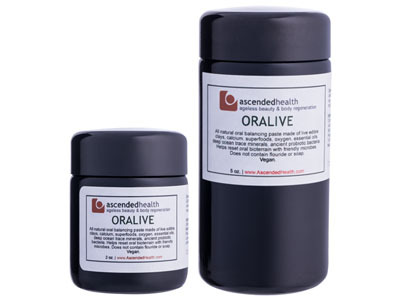 The base of Oralive elixir is comprised of high energy magnetic mineral earth, ethically and consciously harvested from sacred Native American land near Mt. Shasta, California, and in the Big Horn Mountains of Wyoming. We also have added volcanic mineral earth from Micronesian islands. These minerals are complete, and have been shown to oxidize your blood while making your body more alkaline. These earths are considered by their respective indigenous shepherds to be "living” or healing earths. These shepherds believe that when you mix these earths with saliva in your mouth, special enzymes become activated and receptive to the conscious energy you place into it. Before this earth enters your mouth, we have "activated" them with our wire-wrapped lemurian crystals pulsing out healing frequencies. These earths are also intended to act as a chelating binding agent that detoxifies any heavy metals from existing fillings, and to also bind any cofactors associated with gum pain or imbalance. When you swallow the elixir, it is our belief that this earth adds essential nutrients to your body, while simultaneously detoxifying the blood. Concentrated Oxygen: Our toothpaste also contains the power of concentrated oxygen, which removes the anaerobic bacteria underneath your gums causing any imbalance. Using a specially designed hyperbaric chamber, we hyper-oxygenate the oils under pressure before adding them to the Oralive elixir. Some people report that their teeth become much whiter, and their gums healthier, over time (please note that results may vary). All of these ingredients combine into an amazing paste that you use orally, swishing around the mouth for as long as possible. It is safe to swallow, and can further detoxify your blood and aid circulation. In our experience, the paste is slightly gritty and does not foam up (we don't use soap like most toothpastes). It is amazingly energetic, and your mouth will tingle like never before. For those of us that have seen the movie, "What the Bleep Do We Know," we learned that there are famous water experiments by Dr. Masaru Emoto, showing that the actual molecular structure of water is can be affected just by human chanting or even writing. In fact, he has restructured the water of polluted Tokyo city through conscious meditation, and then through writing healing words on jars full of this water. Given that our bodies are more than 70% water, it is natural that we would want to restructure the water used for our remedies to its maximum healing potential. We do this by a combination of direct lemurian crystal resonation, mediation and prayer directed at the batch elixir pastes, and by placing conscious labels on and to the elixir paste itself. Each batch of our elixir is pulsed in a proprietary resonating pyramid chamber filled with lemurian crystals wire-wrapped in Egyptian toroidal coils. We then pipe in healing frequencies such as Shumann earth frequencies, Rife frequencies, Tibetan Chakra bowls, dolphin healing sounds, that then pulse through the crystals, hyper-activating these ingredients like nothing we have ever seen. The difference to us is palpable—you can really feel the energy of this elixir once you swish it around your mouth. Using a modified Lakhovsky/Tesla multi-wave generator embedded with oscillators made from large double-tipped lemurian crystal that has been mined from Minas Gerais, Brazil, the toothpaste you will receive will be connected to these specific lemurian cystals. Pulsed with healing frequencies, these crystals are buried in mineral earth (containing finely ground rose quartz and monatomic gold, silver rhodium), and sending distant frequencies to all the tubes of toothpaste elixir out in the world containing the same batch of earth. The toothpaste you use will respond to your thoughts. Even your ordinary toothpaste, no matter what you use, can better support you by placing a conscious healing intention on the tube. The ingredients in our toothpaste are hyper-sensitive to conscious thought because we designed them to be so. When you get your jar, please make sure to hold it against your chest for just a moment and imagine a time when your mouth was completely healthy. Imagine what that felt like. Now look in the mirror at your open mouth and again, imagine that mouth as perfectly healthy, with nice, pink gums and white teeth. Finish off by giving thanks to your mouth and teeth for serving you so well up until this time. All this will make a big difference in the way your mouth responds to our paste. Prayer is the actual basis of what we call intention, which results in reality. Make sure that your emotions are in alignment with your prayers, i.e. don’t pray from a place of hope (you want something to happen). Instead, pray from a place of gratitude (as if the healing already happened). You will receive what you pray for. It is most effective to pray with gratitude and faith that balance will be restored. Small size for travel & day usage. This is our highly popular all vegan, natural toothpaste that people have been raving about! "This toothpaste is remarkable. It really takes the pain away and stopped my gums from bleeding..."
" I had root canal sugery cancelled because of it..."
The more economicals size of our 2oz Oralive toothpaste. This is a very concentrated and powerful formula with high quality, undiluted essential oils and exotic pain-relieving essences.